Nintendo GBA Game published 16 years ago by Metro 3D, Inc.
Wings © 2003 Metro 3D, Inc.
Cinemaware's WWI action/flight sim comes to Game Boy Advance. In Wings, you'll relive the action, glory and seat-of-the-pants daring of a WWI Allied or German fighter pilot. Wings Advance includes a wide variety of missions, from strafing enemy convoys to bombing aerodromes. You'll also go head-to-head against opposing fliers in first-person dogfights. 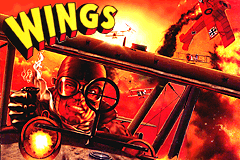 Wings combines arcade-style action (the strafing missions take place in an isometric 3-D perspective) with a first-person flight sim. Between missions, cinema scenes tell the story of the war as it progresses. Wings is easy to pick up and pilot, and challenges players with over 100 increasingly difficult missions. You can fight through the entire Great War and build your pilot from a rookie to an ace. You'll also be able to go head-to-head with up to four friends using the Game Boy Advance Link cable. Released on February 11, 2003 in USA.